None really. 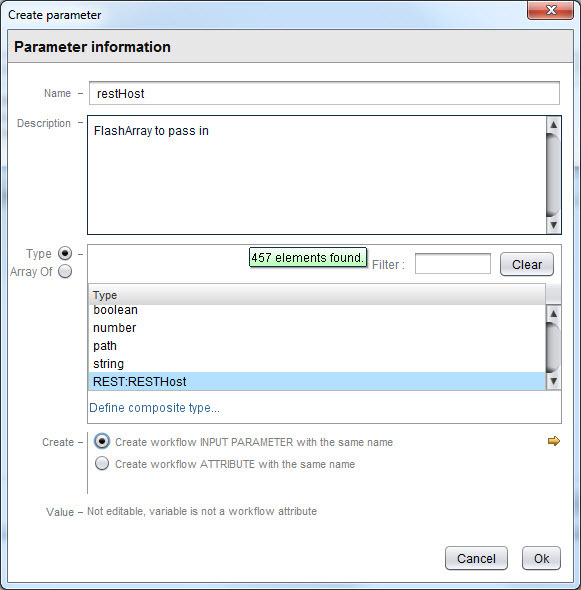 The FlashArray comes with the REST API built-in so there is nothing you need to deploy. REST API version or Purity version doesn’t really matter either. I used the latest though in case you are interested (Purity 4.5.8 and REST 1.4), I recommend vRO 7.0 big time over earlier releases. Essentially this should all work with any version of vRO that includes the REST plugin, which has been around for a few years I believe. Client sends token back to request a session. This session last for a specific period of time depending on the cookie expiration setting. A little more color on the sessions–it is only valid for the currently logged in user of vRO (if someone else logs in when you create the session they cannot use it far as I can tell). If you log out or reboot the box the session cookie will immediately expire. Pretty standard behavior (think web site cookie authentication). From what I can tell from vRO this is 30 minutes (according to the set-cookie session expiration). 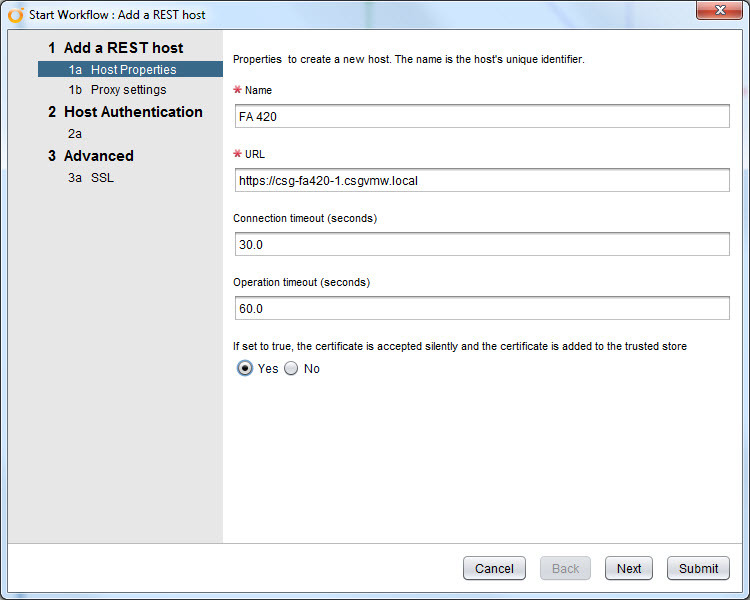 vRO offers a REST Plugin by default that allows you to make REST calls to, well, anything that offers a REST service. There are a bunch of example workflows that can help you make REST calls without much effort already there. So launch the “Add a REST host” workflow. The first step is to add a friendly name to the FlashArray and the URL to the array using “https://”. You can use the IP after that or, preferably, the FQDN. I also changed the default setting from “no” to “yes” to allow vRO to accept the certificate silently, so it doesn’t prompt me to do so. Do whatever you want. Left the timeouts at the defaults. The rest of the wizard can be left at the defaults too. 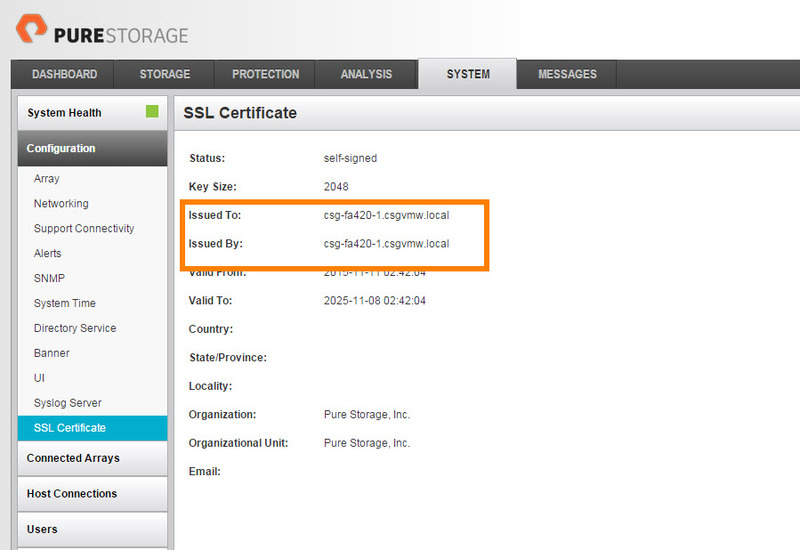 Authentication should be set to NONE as we are just accepting the cert and storing the array info. Not really connecting to the array to do anything just yet. Finish the wizard and it will accept the cert and store the URL of the array. Your cert is not valid. The issued to: line should have the proper FQDN in it. 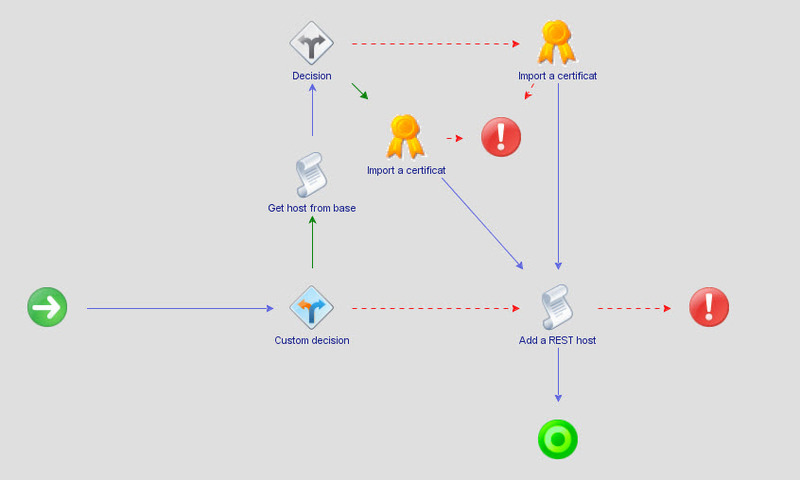 If it doesn’t, re-create the cert (note anything that connects to the FlashArray will need to re-accept the cert if you do this, including your GUI session). Make sure you enter the name properly in the “Common Name” box. Or get a cert from a CA. Okay the FlashArray now exists as a host object in vRO–you can view this object by going to the vRO inventory and drill down to HTTP REST. Just get the token manually from the array and enter it directly in vRO in order to create a session. 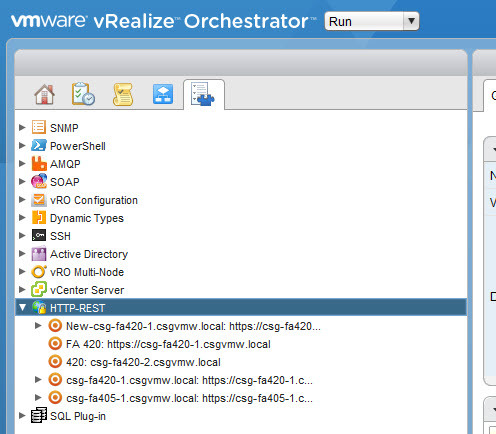 From a config perspective the 2nd is easier–there is less work you have to do in vRO. From an automation perspective the first is definitely more ideal. I will walk through the 1st option though, in order to be more complete. 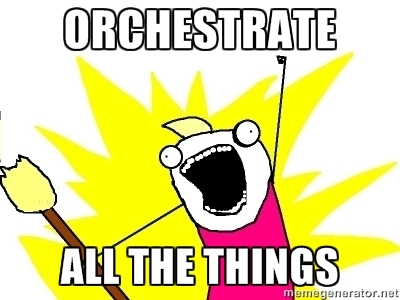 So create a new workflow and add a “Scriptable Task” object to the schema. Edit the script in the scripting tab. Now you want to add some input variables. I have three inputs and one output. Click the little line with two balls on either end to create the variables. So I input the rest host I added earlier and the username and password for it. This makes the REST call with the content in JSON format (the username and password). It builds the content and makes the call. I log out the details and then finally the API token that gets returned by the call. So this only gets us the token, but not the session, we need one more REST call. So we can make another workflow, or we could make this do it all. I am choosing the latter. You can see the added lines after the blank line above. 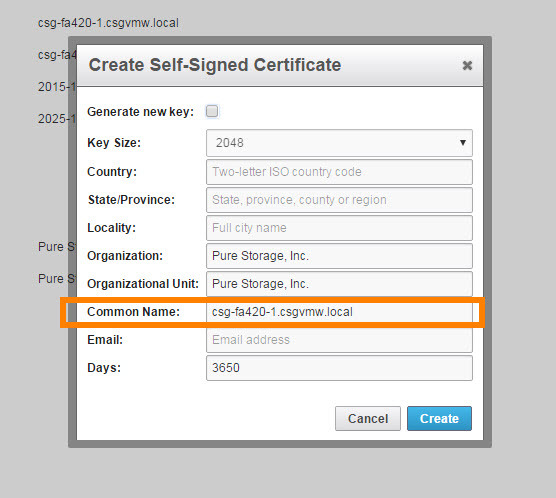 This will create the session–you know success occurred when it returns your username in JSON format. Run this in a parent workflow with whatever other REST calls you need to make. If a subsequent call is in the same parents workflow the session ID/cookie will be passed automatically and it will work. 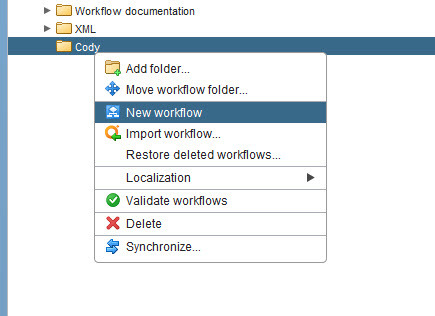 If you want to run separate workflows, you need to get the session ID from the REST response of the session creation call and then somehow pass that to another workflow (either through some kind of global properties that can survive a finished workflow, or through copy/paste). Regardless you need to find the session ID information. This is stored in the header response of the REST API response when you run the second POST operation. There are a bunch of headers, so I just sort through them until I find a match for a header with the term “session” and store that. I return it to that output variable we created earlier. So if you ever need to use that just either manually enter it in or pass it in the request.setHeader operation. The header name would be “Cookie” since it is technically a cookie. Note I store the response in an object and parse it automatically with JSON.parse.